June 27, 2014 - Msg 98316: Oh my..that is so sad Asa ...that poor pilot. Wow. yes MDC..we did get some nice rain this week. Hope you aren't baking there in Arizona. Have a great time SPOT. June 28, 2014 - Msg 98317: G'morning, porch! Beautiful morning here, but clouds starting to come in. No rain in the forecast, though. Robbi and Richard are here, to attend a wedding this evening, Richard's niece is getting married, in an outdoor ceremony. I'm glad there's no rain expected for their sake, but it's going to be hotter than Hades. The humidity is predicted at 55%, temp in the upper 80s, so will be hot. Oh well. It will still be a pretty wedding, I'm sure. I love outdoor weddings, and this one is being held in the Dallas Arboretum, so what more gorgeous setting could there be? We've had such a fun visit. Those two are such easy guests. They don't let me do anything for them, and in fact, they spoil me rotten. After they leave, I'm always feeling a bit stepped-on, because I have to start cooking for myself, cleaning up my own kitchen and nobody is pampering me anymore! Robbi is a great cook, very low-key, no fuss, the food just appears, and like me, she cleans as she goes. Richard is a great grill-meister, so wonderful things appear from that grill. I'm really enjoying having them here. Well, Richard just asked me where he could find some drill bits, so I know he's working on a potting project I had going. I've got some dahlia bulbs that I want to plant in a big old tub-like pot, but it didn't have drain holes. It will when he's finished. Guess I'd better go see if I can help, though I know he won't need me. You know, I've just noticed something. When Robbi or Richard, either one, are out on the little back patio, the squirrels are still very busy and ever-present in the back yard. They seem to understand that the visitors in the yard pose no threat to them. Usually they scatter when someone comes in the yard. They don't run from me, but they will run from anyone else. However, they don't run from R2 (the family code name for Robbi and Richard). I guess they know kind people when they see them. I saw on the news where a pilot landed his plane on the Interstate near Arlington, I think no one was hurt. Oh by the way, I hear Dallas in the running along with Cleveland for the Republican Convention. Cleveland (Cuyahoga County) is not known for being a big Republican area, but I guess it would be a BIG boost for the city's economy. They could all go walleye fishing on Lake Erie afterwards. RO--you must have felt guilty about being pampered so you decided to sweep the porch! ha good job. G-F---I bet the Speaker has a little influence in THAT decision! here, as the mercury moves up here it would fry GF's skitters! June 28, 2014 - Msg 98320: That was FAR OUT, MDC! Downright righteous! Ha! Well, thought some of you might want to know that I received my call today from Danny Romalotti himself... Michael Damian! He was very gracious and quite easy to talk to, even for me, cause I am not known for my conversational abilities. It was kind of weird to hear and recognize the voice that I had heard all those times I had watched The Young And The Restless, and then realize that that voice was talking to me. 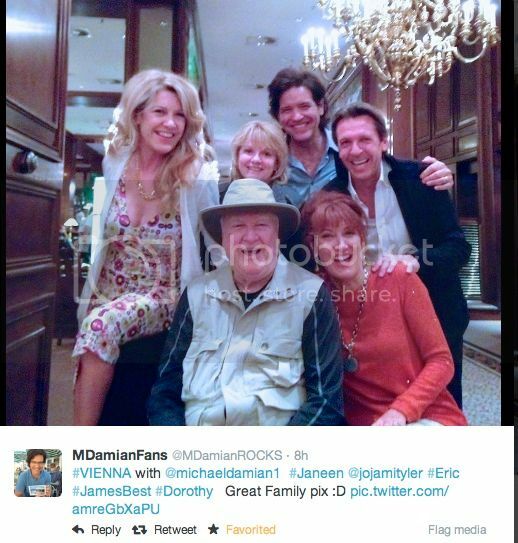 And G-F, I thought of you when Michael brought up his father-in-law, James Best, and he said that he was there with him in Austria. Sure enough a little later on Twitter, there was a pic of him and our own Jim Lindsey. I'll try to post a link to the pic here, though I don't know if it will work. You may have to copy/paste it onto your address bar or something. All in all, a pretty neat day. Hope you all have a blessed Sunday tomorrow. June 29, 2014 - Msg 98323: Very cool indeed, Sterling. He seems to be a very nice person. That's really a fun thing to experience - glad you got to do it! Robbi and Richard are home from the wedding, said it was hot, hot, hot at the wedding, everyone was sweating through their clothes. Imagine, suits and ties for the men with the temp in the upper 80s and the humidity so high. Miserable. However, I guess the wedding itself was beautiful, and they enjoyed it, in spite of the heat. They're going home tomorrow. I'm sorry! I've really enjoyed having them here, and will be sad to see them go. They're fun, and helpful, and have pampered me shamelessly. I'm going to feel very stepped-on when I have to start doing for myself again. June 29, 2014 - Msg 98325: Good Sabbath porch. Glad you had a good time Spot. Now it's back on the treadmill. Try to ease back into the world of work. Glad you got to spend some time with your family Romeena. I always figured creature have an inner radar that warns them if someone is friend or foe. Hey GF, how's the honey doo list coming along? I was watching the episode when the hobo comes to town. As he sat on the porch sreps and debated on just how he was gonna prune the bushes, and how he told Opie that there was a lot of thought and discussion one must do before starting such a project made me think about you. Not equating you to David Browne, but it seems being retired now that you have a little more time to think projects out more than just going in full bore. At least I hope that is the way it is a little bit because I am looking forward to that. We are going to be pushing triple digits this week MDC, so I reckon you will be real toasty. Glad you got a new a/c unit. Well better get going to preaching. I ain't doing the preaching this week so I can relax. June 29, 2014 - Msg 98327: Hey, Sterling, I recognize that Romalatti guy once I saw his picture..he has been around a long time because I remember him from years ago when my mom used too watch Y&R. Neat that you got to talk to him. Glad you enjoyed a day a the lake, SPOT.Did you see a Web-Footed Red Crested Lake Loon?? Just wonderin'. Nice, relaxing Sunday here but hot as blazes...at least we have a breeze, though. June 29, 2014 - Msg 98328: Any of you have any plans for the 4th of July? I think we will be having supper here at my house and maybe some homemade ice cream if I am feeling the urge to make some. ASA--Yup, we will be 110 to 113 all this week! yuck! those lost emails, ...congress could just ask the NSA for them! Why is that funny, yet sad at the same time? Here in my area we just set the fireworks down on the lawn and they go off by spontaneous combustion! lol Loved the pic of bruce and Thelma Lou on FB! June 30, 2014 - Msg 98330: Howdy, porch. It's the middle of the night, and I'm still up. After R2 left, right after lunch, I plopped in my chair and fell asleep, slept about three hours. Now I'm all wide-eyed, no point in even trying to go to bed and sleep, and I have an appointment with the audiologist in just about eight hours. Hope I don't fall asleep while we're discussing hearing aids. Sure is lonesome around here without Robbi and Richard. They're such good company, and low-maintenance doesn't even begin to describe them. When they left, the linens from their room had been washed and put back on the bed, and the towels they had used were in the dryer. An orchid that Eloise gave me for Christmas had been repotted, so will be growing like mad in a few weeks. My dahlias have been planted in their big, newly-drilled out tub, the stuff in the garage has been sorted, condensed and the floor swept. Honestly, those two are a wonder. Boo, would you mind asking Sean a question for me? I have a little Dirt Devil, small canister vacuum, Model 082023. It's old, but has very powerful suction, and is a favorite of mine for cleaning hard surfaces. Problem - the hose line is old and crimps if you look at it crooked, making the motor scream because the hose is blocked by the crimp. I'm pretty sure the hose is going to crack soon where it keeps crimping. I've tried to buy a new one online, but everything I can find says it's no longer made and not available. Might Sean have any suggestion as to where I might be able to get one? I really hate to replace the machine for lack of a hose, especially since I probably won't like a new one as well as I like this little old friend. June 30, 2014 - Msg 98332: Thanks, PH. From that site, I could probably build a whole new vacuum - all but the hose. Every other part of the unit is listed there, but no hose. The end pieces, everything, but the hose itself. I may go visit a repair shop and see if they can come up with anything. I don't care if it's the actual Dirt Devil hose - if it will just attach properly to the vacuum and the wands, that's all I want. The little vacuum is a work horse, and I hate to just discard it. Well, I'm off to the audiologist to see how much she's going to lighten my wallet for the hearing aids I need. I hope there's a payment plan! I'm so tired of asking people to repeat all the time. It's annoying to them, and even more so to me. June 30, 2014 - Msg 98333: Happy Monday Porch! Checking in from work today. busy day ahead for me. hope everyone had a good week end. It has been hot and humid on my end of the porch. at some point we have had rain and storms daily. Guess it is that time of year for us. We had our driveway repaved last Friday. Our other driveway had seen better days, it was caving in places and the asphalt was cracking. Apparently whom every had paved the original driveway 30+ year ago did a poor job so over the years it just fell apart. Anyway we had it dug up, regraded and paved. The company we contracted with did an excellent job and was very reasonable on their cost. Today is the first day we can drive on it so I am excited. Guess it is the little things that make Ole Maude happy. dinner menu will be: grilled BBQ chicken, roasted potatoes, grilled corn on the cob, sliced tomatoes, sliced cucumbers, fresh green beans. oreo pie for dessert. tea and lemonade to drink. Romeena, I think this is a case where you can't see the forest for the trees. Yes there is no hose image in the exploded parts diagram. However, scroll down a little below the exploded parts diagram until you see a table listing all the parts for the Dirt Devil. Look at the first two parts at the top of this table. They are both labelled ITEM 0. Closely examine the second ITEM 0 and you will see a link labelled Hose (Not Shown Above) in the PRODUCT NAME column. Click on this link and that will take you to the link I posted in Msg 98331. If you read the description on this page, it will confirm that HOSE 8770 will fit the Dirt Devil 082023. This is also the order page for for that hose where it also states "This Royal/Dirt Devil Hose 8770 can be delivered in the United States in 3 to 7 business days! Orders placed by 2:00 PM central time ship the day they are placed." This provides you with everything you need to order HOSE 8770 for Dirt Devil 082023. June 30, 2014 - Msg 98335: Hooray! Poor Horatio, your education was worth every penny, and then some! You are exactly right, the hose was there, and is now duly ordered and on its way to me. Thank you so much!! Actually, I think I'm paying as much or more for that hose than I paid for the whole vacuum all those years ago, but it's less than a new one would cost now, and I might not like the new one as much as I like this one. The little rascal has served me well. It will be wonderful to be able to use it without having to dedicate one hand to squeezing the crimped hose crossways to keep it open. Actually, I have another canister vac, but it doesn't do the job half as well as my little red Dirt Devil. Also, my big old Bissell carpet cleaner has a lift-off feature that is designed for portability, but I've never liked it either. Now I'll have my faithful little Dirt Devil feeling up to par again, and I'll be a cleaning whiz around here! Thanks again. I went to the audiologist today, to start the process on getting my hearing aids. You don't just walk in, pay for them and walk out. As she put it, we're going to get well-acquainted over the next five to seven weeks. I get the devices next Monday, and she will begin the programming sequence. They're programmable by her, using an interface on her computer that "talks" to the devices, and she can tweak and adjust them as needed. She can set the sensitivity to sounds, the directionality, filter background noise, adjust the volume of the output to me, among other things. She said I'll get them, she'll do the initial programming and I'll wear them for a week, then return to her. Based on my response, she'll re-program and adjust them each week until we get to optimal function. I had been considering ordering a set of the ones you see advertised in magazines, until I found out that a pair of those would cost $599. They would be mailed to me, and I would be on my own. The only adjustment available on them is a little slider on the back of the unit that controls volume. That's it. I'm paying considerably more ($4800 for the pair), but I have all this personalized adjustment and programming, I have free repairs,cleaning and scheduled maintenance for two years, and a year's supply of batteries comes with them, as well as spare ear buds. I have a year to pay them off at no interest. They're virtually invisible, just a tiny unit, about 1" long that rests behind my ears, a thin transparent tube that comes around the front of my ear and leads to a little clear dome, about the size of a small pea, that rests in the ear canal. I couldn't even feel it when she put the demo units in place, but I sure could hear better, and that was without any personalized adjustment. I think I'm going to be very happy that I did this, and I know people around me will be glad, because they won't be having to repeat for me all the time. I just wish insur@nce and/or Medicare would at least share in the cost, but they don't. Oh well. I'm just glad the technology is there, and I can (somehow) afford it. 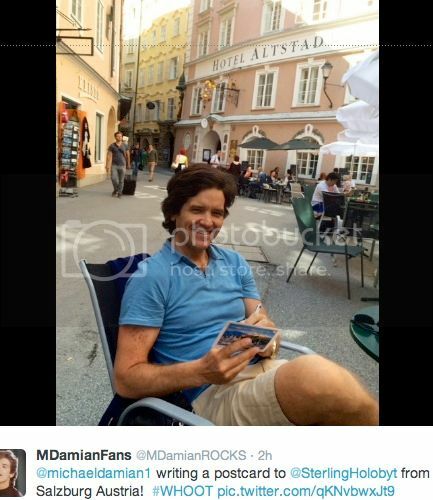 June 30, 2014 - Msg 98336: That's really cool about you receiving the phone call from Michael Damian, Sterling. I used to watch Y& R and remember his role as Danny quite well. Besides being an actor,he's also a musician. He did a cover of the David Essex song "Rock on" years ago that was really good. Thanks for sharing the pics and your excitement with us! Where are my a men-a-knees? HEY! To everyone else! June 30, 2014 - Msg 98338: Romeena, Be sure when she programs your hearing aids it doesn't open your neighbors garage door too..haha Just think how good you'll be able to hear all your critters now. Eh? Eh? Very funny PH! That was a real knee slapper. RO--My aunt has hearing aids, and she goes thru batteries like carter goes thru liver pills! They are about 9 yerss old however. I have a little more hope for our future. Big Maude--so you paved O'Malleys driveway? Out here ours are concrete, not asphalt. ASA--You mentioned the hobo episode, I always like the ending how Andy chastises him about the shiny objects, and then how they hook you. Great moral. Well Romeena, sorry for the cost of those things but as you said, ain't it great to have the option and ability to obtain such stuff. I fear I'm going to be in the same boat a few years from now. Too many years in Drag racing, shooting guns, and working in a noisy shop has caught up to me. I have a constant ringing in my left ear that is very annoying. Oh well, such is life. GF, You are a bird in this world buddy, leaving one little branch untrimmed for your wives sake. LOL, You crack me up buddy. You doing ok Boo? I'm worried about you dear. Hang in there. I know it's tough right now, but God will see you through it. Hey MDC, so very true about the message at the end of the Hobo episode. But all of the TAGS episodes have such decent moral messages. Last night I watched Barney and the Choir. Such wonderful humor, again especially at the end when Barney thinks that is his voice booming over the speakers. The look at first of surprise, then followed by confidence, finishing up with proud humility as the crowd and the rest of the choir applaud him. One of Don Knotts best performances IMNSHO. But the real moral of the story was Barney being such a terrible singer, but no one wanting to tell him that and hurt his feelings. They all went to such great lengths to save his feelings. You just have to love it. July 01, 2014 - Msg 98344: Good morning, porch! PH, your internet research skills are impressive! I checked those two sites, and there's a lot of good information there. There are several qualifying categories, but unfortunately, I don't think I fit in anywhere. I'm not a dependent of an active duty military person. My income level is above the level that would qualify me for most of the programs. I'd prefer not to purchase recycled aids. I might be able to get assistance if my Medicare supplement was a Plan C, but it's not and I'm not willing to change my insur@nce plan to a Medicare Advantage plan, at least not at this time, for a one-time thing. I guess I'll just continue with what I'm doing and be grateful that I can do it. I'll have to pinch a few pennies, but at least I have the pennies to pinch! I'm very glad to know that there are programs out there that make help available for those who might not. Very cool technology thing just happened. I changed my security system last week, and am still getting used to using it. Last night, I noticed that even though I had done the things to arm both the doors and windows and the motion sensors, the motions weren't armed. The display, while arming, had said they were arming, but at the end of the beeps, that light went out. I tested them by walking around in front of one of the sensors, and it didn't alarm. So I called my contact person, he had the installer call me back, and by phone, he directed me and I re-programmed the unit so it now accepts the command and arms the sensors as well. Technology - ya gotta love it! You know, I think I was born at a very wonderful time. I was a child in the 40s, so got a dose of high patriotism during WWII. I was a teen in the 50s, and how fun was that! We even had an "Arnold's" (like Happy Days) only it was called Buddy's. Compared to my 50s experience, the 60s-80s didn't appeal to me much, but they were still good years. Now I'm living in the age of all this technology - computers, smart phones, programmable stuff - and though I'm old, I'm still young enough to be able to participate. I can hardly wait to see what comes next! I just hope I can keep up. Romeena, I offered the second link in my Msg 98341 without knowing if you met the income requirements. As for the first link in my Msg 98341, since you are a part time home health worker, I thought you might qualify under "Vocational Rehabilitation Services" where they "may provide hearing aids and assistive devices for qualifying adults who want to maintain current employment or who are seeking employment". Call their telephone number for more information. July 01, 2014 - Msg 98347: Thank you for your concern, Asa...today has not been one of my better days. Excuse me while I channel Gladys Kravitz and tell you all about how my week is going. I have been crying off and on and a little depressed..unmotivated...threw my back out on sunday so I am walking funny, Erin has headlice again, the air conditioner in my car went out, the dryer stopped working and my bathroom sink is clogged. Other than that, things are ok! HAHAHA I know things will look brighter tomorrow and Bruce already unclogged the sink. He just walked by and said, "Master, can I rest before I start on the dryer?" July 01, 2014 - Msg 98349: Haha! Thank heaven for a man with a sense of humor. Dale had an uncanny ability to make me laugh when I was upset or feeling blue. That's a priceless gift. PH, regarding the vocational rehab services, I had checked them out last year, when I had my first audiology test done. The doc gave me the referral, I made an appointment and showed up at a meeting that was held here in Irving. I had expected a private appointment, but found myself in a large room with about two dozen people, all looking for work. It seems their services cover other things besides hearing aids, including vocational training. There was a guy who lived in his van and needed a shower, a woman who was dressed like a "lady of the evening", a girl who had so many tattoos and piercings she looked like a Christmas tree, two guys who were equally decorated, a poor fellow who must have weighed 500 pounds and was sweating profusely the whole time, an exhausted young woman who brought three kids with her, and the list goes on. Many of them mentioned having no transportation. As I sat there, with my dependable car on the parking lot, my RN license securely in my wallet, and a job waiting for me at the hospital if I chose to go back, I realized I probably didn't belong there. There was a lengthy talk by a woman, outlining the services available. During a break, I spoke with her, told her my situation, and asked if I was in the wrong place. Her answer was simple - "Yep. Probably." So, I left, thanking God for my blessings. I very much appreciate your research and efforts on my behalf, but I've about concluded that the best thing for me to do is pay for my hearing aids and be thankful that I can. Like I said, I'll have to pinch pennies, but I'm grateful that I have some pennies to pinch. The fact is, I could SOS my children, and they'd pitch in and cover it for me, but I'd prefer not to do that. Those days may come, but they're not here yet. Boo, take it one day at a time, love. I know you do that, but sometimes it helps to be reminded. You're emotionally exhausted, which quickly leads to physical exhaustion. As for Erin, where on earth does she keep picking up those miserable bugs? Could she be getting them from those kids next door? That's such an ordeal - those things are the very devil to get rid of. Well anyway, prayers for you, my friend. This too shall pass. July 02, 2014 - Msg 98350: RO-- your meeting made me think of Paul's statement, "But by the grace of God, there go I." Profound words. if you get a minute. Prayers for Erin. TOM, How is you SIL doing? Have they decided on a treatment plan yet? Boo, My heart goes out for you...Stay strong, look on the bright side, at least you did not have to chase run-away donkeys. Sounds like Bernie has the Funny Farm in order. July 02, 2014 - Msg 98352: I'm so sorry Boo. Sounds like a rough week for sure. But you are strong, especially Spiritually strong, and that's where it counts. You hang in there. You have the porch praying for you. And please don't hesitate to come here on the Porch an unburden yourself. It's very therapedic. And there are a lot of listening ears. July 02, 2014 - Msg 98353: Don't know what happened on that post, it got jumbled up. July 02, 2014 - Msg 98355: Aw, Ihave such sweet friends here on the porch!...thank you for letting me talk when I need to. Today is already feeling a little better. I am just trying to get motivated to do some cleaning. Again, thank you all for your prayers and words of encouragement..they mean so much. Thank you G-F for posting that video. How wonderful it is that REV can still comfort and encourage us through his music. Love that man and look forward to seeing him again. As I said, yesterday wasn't a great day and then sean came home visibly upset and went straight to his room. Uh oh...what now? I went to check on him and he was very upset because he was in the new car side of the parking lot on his golf cart and he hopped in, thinking it was in drive, but it was in reverse, and he backed into the most expensive new truck on the lot. He only did a little damage to the bumper but he was devastated. He tends to be a perfectionist and is so hard on himself if he makes a mistake (his dad is like that, too). The boss took his golf cart away so now his job will be a lot harder. Oh well, that's life. Things happen. He is also dealing with a broken heart right now. He has a childhood friend that has been his "girlfriend" (Alaina) off and on, and she has started dating his best friend, Josh. He confided in my about it last night, saying that he is in love with her and thought she would be the one he would spend the rest of his life with. Of course, he is only 19, and we all know that broken hearts are part of growing up, but this is hard on him, especially since she is with his best friend now. At their age, things can change overnight, and its just part of growing up. I know it hurts, though, and he is depressed over it. I guess its just been a tough month for all of us. Better eat some oatmeal and get some things done around here. July 02, 2014 - Msg 98358: Good morning, porch. Boo, I'm sorry to hear about Sean's troubles. We know from experience that at his age, these things are inevitable and they're not "forever", but he doesn't know that, so it's all a very big deal for him. As for you, you're physically tired, and you're experiencing the emotional backlash that always comes in the wake of the loss of a loved one. You've been through a storm, Sean is in the middle of a squall of his own, but as you both know, God is bigger than our storms, no matter how rough they may seem. If that girl is putting herself out of his reach, then it's because God has someone else in mind for Sean, and she will appear in God's good time. If you suggest to Sean that he begin to pray for that girl, whomever and wherever she may be, and ask God to keep her safe and to bring her into his life at the right time, maybe that will give him a new focus and help him deal with the current situation a little easier. G-F, thank you so much for that link. The video was beautiful, and hearing REV's sweet voice singing the song he wrote himself brought me to tears. I loved him. He was a precious and dear friend, from the day I first met him. It was one of those things that happen so very rarely, and many people never experience it at all. It's a gift when it does occur. I met him in the aisle of a church in a Dallas suburb, where I had gone to hear his concert. He knew I was coming, and knew who I was when he saw me. He explained later that he knew me, because we were in an Assembly of God church, and I was the only woman with short hair and wearing makeup! Doesn't that sound like him? Anyway, when we met in the aisle, he swept me into a big old hug and I knew I had met a friend. Later, as we talked, I could almost hear a click as our personalities meshed. He was one of the easiest people to talk to and just be with, that I've ever met. A true gentleman, a caring friend, a brother. He made himself comfortable here with my family, was so kind to my grandsons, and it seemed like we had known him forever. Friends like that are very rare. Why God called him home so soon, is one of the questions on my list, for when I meet our Lord. I'm not arguing with God, I know there are reasons, I'd just like to understand them, and someday, I will. We all will. You know, I used to seriously ask why God took Dale so young, but now, as I watch my peers at church, as they deal with aging husbands, I'm beginning to understand. Seeing those frail women struggling with their husband's wheelchair, or trying to help a husband make sense of things when Alzheimer's is taking him away by inches, or dealing with a death now, when the wife is not well herself and has no strength to carry on alone - I find myself almost thanking God for taking Dale when He did. Not quite, but almost. July 02, 2014 - Msg 98359: Afternoon porch. Hope the day finds you all well and dandy. Now Romeena, your perspective of things is very interesting indeed. But it seems to be consistent with your ability to find good in any situation. That's one of the things I love about you. You get handed a lemon and you make a tasty lemonade. I wish more folks were like you. You inspire me. Boo, So sorry Sean has a broken heart and a broken cart, bless his heart. I'm glad he has good parents like you and Bruce to help him along with these bumps in life. I remember when I was just a year younger than him. I was infatuated with this girl I had met. I mean I was head over heels in love with her. But she just didn't see me as anything more than a friend. I tried to woo her with everything I could, but to no avail. So I finally had to give up on her. Very hard. I know I moped around for quite awhile afterwards. But once I got her out of my system I realized how silly I had been to have tried so hard. 4 years later I was married to my real sweetheart and never looked back. I know Sean will eventually come to grips with it. One day he will find a gal that will turn his head and it will all work out. Taking tomorrow off work. I am at use or lose on vacation so I might as well make it a 4 day weekend. Guess I better get things wrapped up here so I can enjoy the weekend. Romeena, after reading about your visit to vocational rehab services, it read like an audition for a comedy television program and not a visit to a government agency office. Sorry nothing I offered could help you with purchasing a hearing aid. Can you at least deduct the hearing aid and batteries purchase on your income tax? Boo, so sorry to hear about your recent depression. Hopefully it is just a temporary phase that shall pass soon. In the meantime, take a day off from chores just to relax. As for Sean's problem at work and with his personal life, that needs attention. He has to concentrate on his future work performance in order to regain his employer's trust once again. And as for the girlfriend situation, he needs to be reminded that love relationships are a two way street. When only one person is interested, it is better to learn about that early rather than later on like after a marriage when breaking up can get expensive. As for Erin's head lice problem, is she sharing hats or combs with anyone? pappa bear, we will all be looking forward to hearing from you after your surgery. In the meantime, you will be in our prayers. July 02, 2014 - Msg 98361: Thanks, Asa. Your comments are very humbling. I hope I always try to find the good in a situation. I was brought up by parents who did exactly that, always, and I try to remember what they modeled for me. Sometimes it's hard. It took me a very long time before I could even accept the possibility of Dale's death being anything but an unfair tragedy in my life. PH, that's pretty much how I felt, sitting there in that group of people who were seeking help to get qualified for employment. I definitely felt out of place. Besides that, I knew it was a stretch to be saying that I needed the aids in order to qualify for my job. That wasn't entirely true, though there's no question that better hearing will be a benefit, when I'm trying to interview a feeble little person. As for deducting it on income tax, that's a very good question, and I'm glad you mentioned it. I'll talk to my CPA and find out, and if it's deductible, I'll try very hard to get it all paid for this year, so there'll be a better chance that the total will be enough to qualify. Well, TAGS is on TVLand right now, guess I'll go watch it. I don't know why it is, but I love watching what is being televised. I have the entire series on DVD, but I still watch the little chopped-up versions on TV. Go figure. Thanks to each of you for the great advice, my friends (you feel more like family than friends). I appreciate your shared wisdom more than you could know. PH-I know that Erin was reinfested with the head lice from the little girls next door. It is so hard to keep them separated and they are the ones with the abusive stepdad. July 02, 2014 - Msg 98363: I have something to tell you all that you will find hard to believe...make what you will of it, I am just going to tell you how it happened. Earlier this morning when I was here on the porch, I was using Sean's laptop to check in and listen to the video that was posted of REV. I made the comment about how Rev is still able to comfort us with his music. Well, several hours later, my android phone rang and it was my sister. I talked for a second, hung up and laid the phone down on the table. Now, it is important to know that I did not watch REV's video on my phone, nor is it synced in anyway to Sean's laptop. So, a few minutes after I sat the phone down from talking to my sister, I picked it up from the table and out of nowhere, the screen lit up and a video of REV started playing. It wasn't the same one that was shared here, but a video of a concert done in 2013. I have no explanation for it. I had not been on youtube, nor had I ever watched REV's videos on my phone. I don't know what to think but I had to smile. I'm still wondering...what do you all think? SPOT--Should we all watch the episode "The Rumor?" ha Tell us when you're ready buddy. We'll keep POSsum under her rock. RO--what you say reminds me of that well-worn expression...True friends are like diamonds, they are precious and rare. ASA-- enjoy your time off, give the ole back a rest. GF--they are predicting some rain on Friday here! July 03, 2014 - Msg 98367: "they seem". July 03, 2014 - Msg 98368: In 2002, when my grandson was born and lived only an hour, a remarkable thing occurred during that hour of his life. I may have recounted this before, but it fits here. We had him in his mother's room, knowing full well that he was dying. He had physical anomalies that were not compatible with life, but he was trying. There were several cameras in the room, most of them digital, and one or two with film. Anyone was free to pick up any camera and take a picture if they felt like it, and many of us did. The hospital had been kind enough to provide a very large room, and Brittney and David had very generously opened the room to all family and close friends. We took turns holding the baby, returning him to his mother frequently. The doctor was checking in every ten minutes or so, to monitor his condition. He was not breathing, as he had no real lung function, but his little heart just kept plugging along. At one point, someone picked up one of the film cameras and took a picture of David, sitting in a rocking chair, with his tiny son lying on his lap. No one knows who took the shot, as there were other similar ones taken around the same time, and no one remembers what camera they used. After David had held him for about five minutes, the doctor came in, checked him, and told us he was gone. He had passed during those few minutes on his daddy's lap. The next morning, David and I took the film from the two film cameras to a quick-develop place, and when we picked the pictures up about an hour later, we received quite a shock. In one picture, and only one, a brilliant beam of light is seen coming in from one side, and it ends, just stops, right on the baby's face. The light is so bright that you can just barely make out the outline of Logan's little head, but the light doesn't extend past him. Also, the beam of light has a very slight curve to it, it's not a straight line, as a light-leak would be. There were over a dozen shots taken with that camera, and the light doesn't appear in any others, which pretty much also rules out a light-leak in the camera. Also, in all the others, the flash deployed, illuminating the room, but in this one, it did not. The room is in semi-darkness, as it was that day, but the baby is bathed in that light, so bright that his image is almost washed out. David doesn't remember any flash of light, but evidently the camera registered it, because it didn't deploy the flash. So, there you have it. What was that light? In my heart, I believe it was a pathway sent to bring that little soul home to the Father. I can't prove it, but neither can anyone disprove it. A professional photographer friend of Brittney's once told her that he wouldn't dare to try to explain it. My pastor advised us to "leave it alone and let it bless your hearts." That's what we have done. July 03, 2014 - Msg 98369: Boo, Maybe REV wanted you to hear a different song than the one I posted, that's what I'm thinkin'....Or as Romenna's pastor said: "Leave it alone and let it bless your heart"....And folks, after hearing Boo's & Romeena's stories, That's why we call it faith! July 03, 2014 - Msg 98371: Ro, I remember the picture of your grand baby..really amazing. One thing I didn't mention is that my phone screen stays locked until you unlock it by pressing a button on the side and the swiping the screen in a certain spot. That phone was locked as it sat on that table and when I picked it up the video started playing immediately even though the screen was locked. Unusual to say the least. looking forward to the big news Spot!